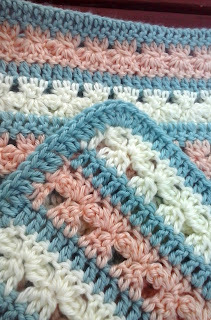 Peach, Turquoise and Cream in little flower rows make a fantastically cute blanket! 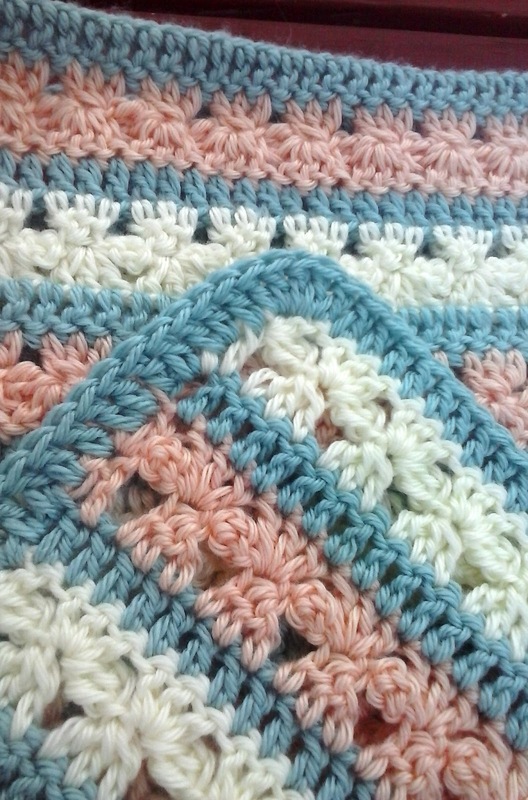 This blanket is easy and fun to make! Wanna make a different size? The multiples of this blanket is 3. 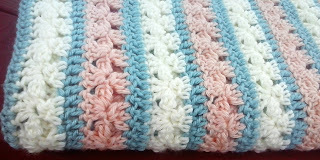 There is no "special stitch" for this blanket- the flowers are made by rows. Just take care in making the petals using the details in the instructions. Row 1: dc in 4th ch from hook and across. Change color to begin next row. I just started the afghan and am on row 3. At the beginning of the row it looks like I make a petal, but it only seems like there is the one on this row. Everything else looks like it is just 3dc in the top of the cluster below. Is this correct? It seems odd that it is just at the beginning. Please let me know, as I don't want to continue until I find out. Mary V.
If it's the top of the petals, then you begin the row with just a couple of double crochet in the very first stitch, then three double crochet shells in the top of each dc3tog across. 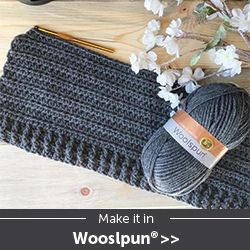 How did you get the blue border down the sides of the blanket? It doesn't look like a separate border when you start the first row with the blue. I really want to make this but would love to know the answer to this. Happy Hooking and thanks so much for stopping by! So did you start with the blue or did you start on the flower row? 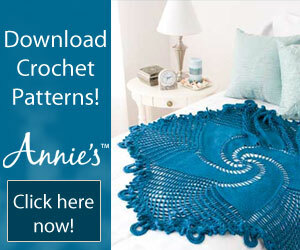 I can only see a one dbl crochet row of border versus starting with blue (dbl crochet row). If you started on the flower row, how do you do that? Sorry about that Beth. Yeah, I started my foundation chain and first row with blue then went from there. Thank you. Going to do one is shades of green. Hope it looks as nice as yours. Going to try some of your other patterns too. I make and donate to a pregnancy crisis shelter and Sick children's hospitals. How did you finish it off. It looks like you went around the whole thing with dc in blue but it isn't in the pattern. 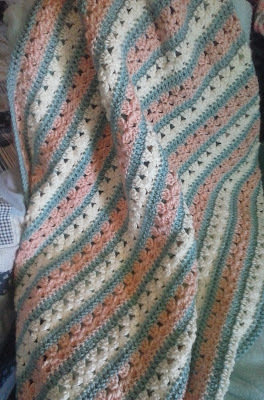 In my reply to Beth Kennedy above, I put double crochet around one time in the same yarn I did the dc rows in between. In Row 4 could you please elaborate "dc in next dc and across". I am unclear how to recognize what is considered "next dc". Only the first dc from the previous row is clear to me. Thank you. When you chain up at the beginning of the row, that typically counts as the first stitch or first dc in this case. So then you dc in the next dc.. so find the next stitch in the row immediately below and dc into it. Thank you for your reply. You must have found my quetion rather strange. I realized that the reason I did not see any dc in the preceding row (other than the last one in the preceding row) is that when I did Row 3 my eyes wandered to Row 2 and where I had to do 3 dc in one st, I did a 3dctog! The flower looked like a flower with that extra petal on top, so I thought it as okay and that it would be used later. Reader error! Apologies. so either I crochet this foundation more loosely or use a bigger hook for the foundation. What size is your skein? I would like to make this for my adult daughter in a larger size, but do want to get enough yarn. Thank you for the multiple so that I can increase it. I used the standard sized Caron Simply Soft skeins of yarn plus a left over from Bernat Satin (I think) for the teal stripe.